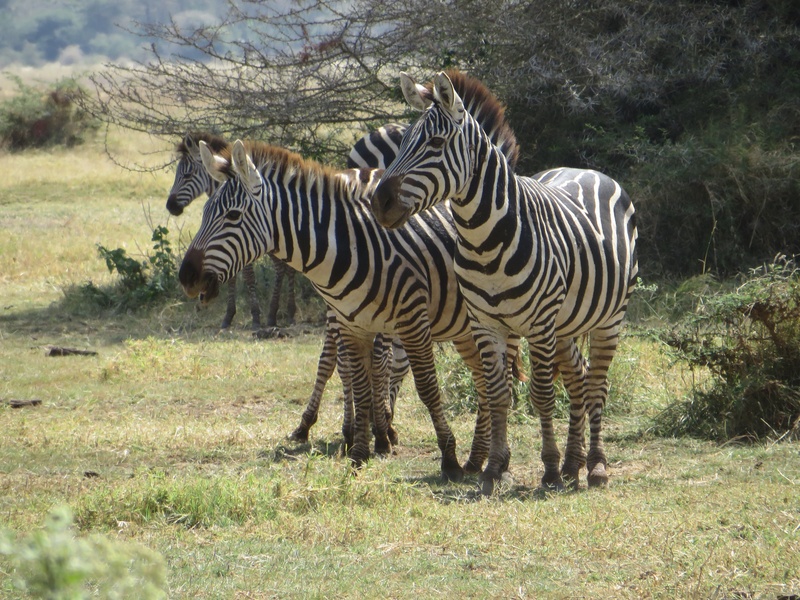 Today we headed off to Lake Manyara for our first day of our three day safari! 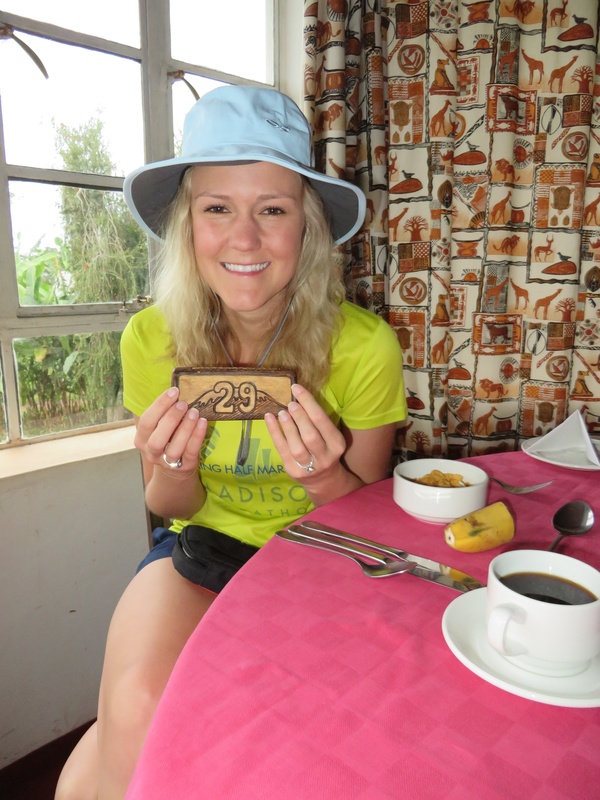 Marangu Hotel arranged for us to have an earlier breakfast than usual (can we say again how great they were?? ), so we enjoyed our last breakfast with them of eggs, all kinds of breakfast meats, cereal, breads, juices, and fruit. 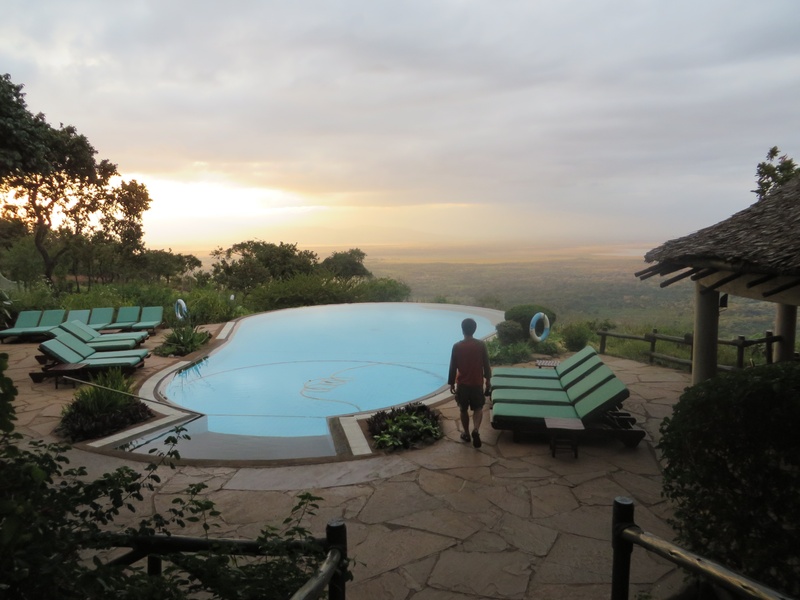 Then, our safari guide (Casey) arrived at the hotel to take us to Lake Manyara. Poor Casey had to figure out how to haul all of our crap plus us in his land cruiser! Keep in mind that we still have all of our donations for Amani School with us that we are taking around everywhere – two huge and heavy bags, plus all of our climbing gear and Europe stuff! We loaded up the Land Cruiser (with a safari pop top and a big crack in the windshield covered by a “I have visited Ngorongoro Crater” bumper sticker 🙂 ) and were off. 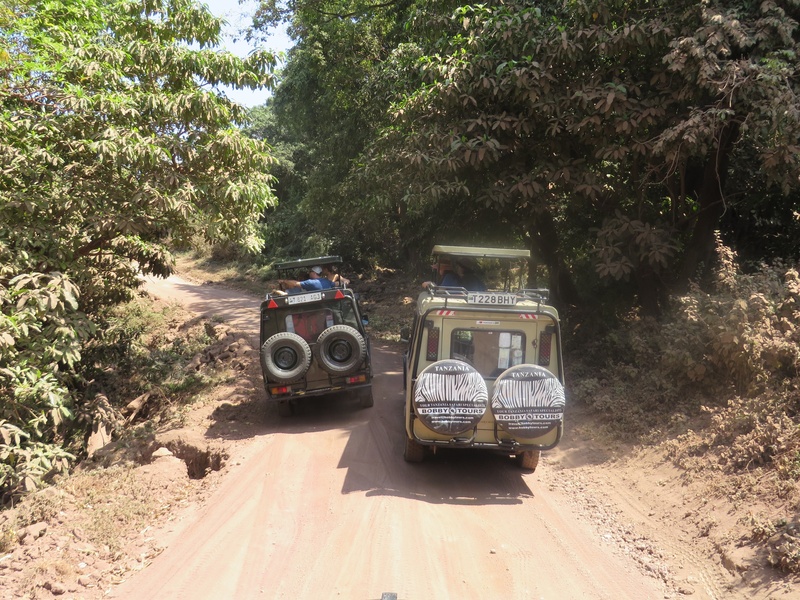 We were prepared for a two hour jaunt to Lake Manyara – then it ended up being a 5.5 hour ride through Moshi, Arusha, and rural Tanzania. We saw camels without the humps and several housing abodes along the way. The roads in TZ leave little to be desired – there aren’t many roads, they are bumpy, and they all have random stops along the way, speed bump style. 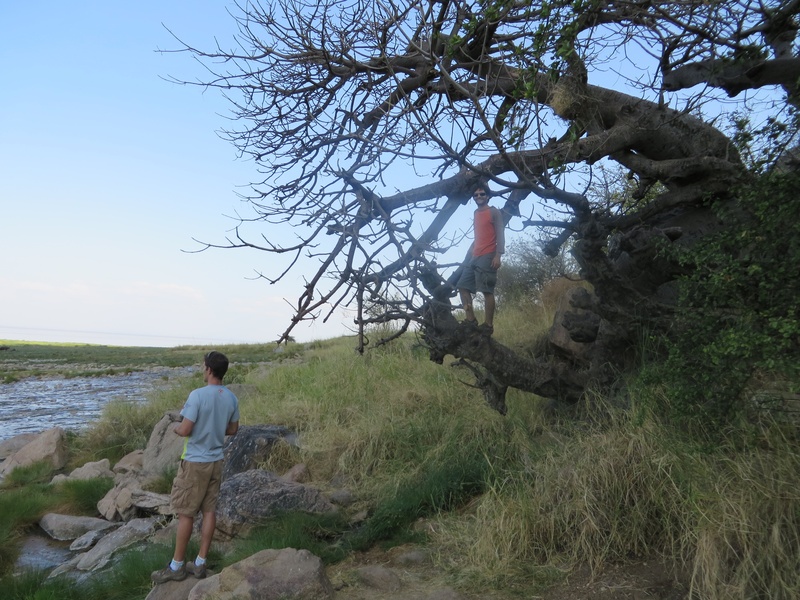 We finally made it to Lake Manyara and ate our picnic lunch in the park while Casey set up the pop top. 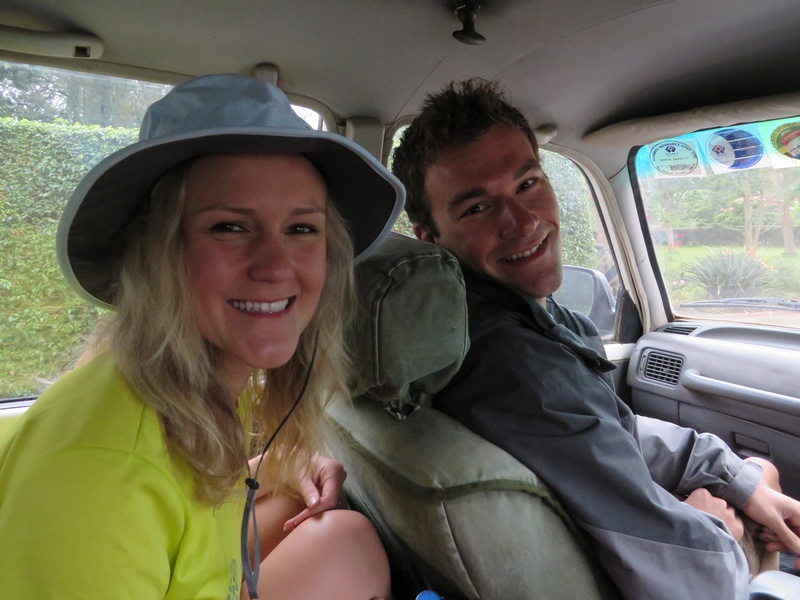 Brad and I had seatbelts in the Land Cruiser that didn’t release…so it took us some time to climb out of those. Imagine climbing out of your car if your seatbelt didn’t release! It was a pretty interesting challenge. Then, time to start safari! We headed in to the park, and it was pretty much what I had imagined. For anyone that’s been to Disneyworld and done the safari ride there, they pretty much hit it right on the head! Everything is super dusty and bumpy, and everyone hangs out of the car searching for animals. 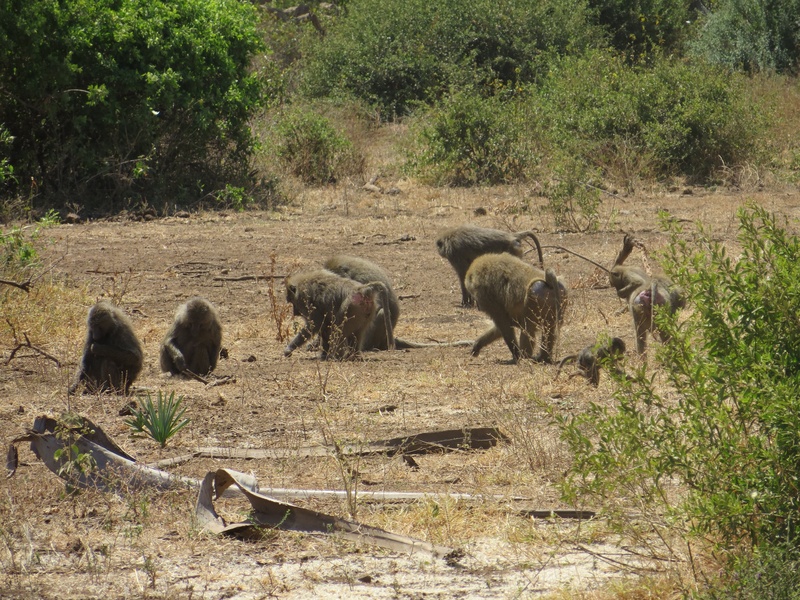 We first came across a baboon tribe that was enjoying eating some fruit. 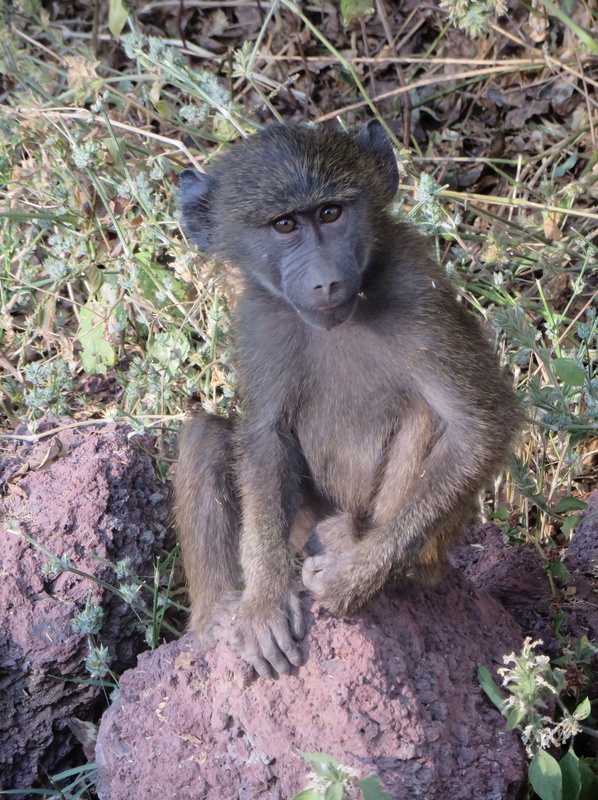 Then, we saw more monkeys…then elephants! 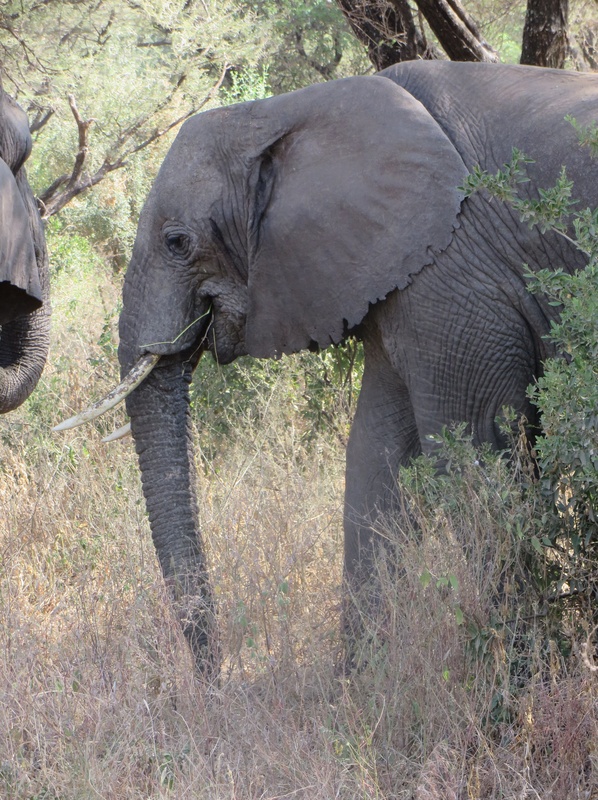 These elephants were so close to us – they just didn’t care about the car at all. 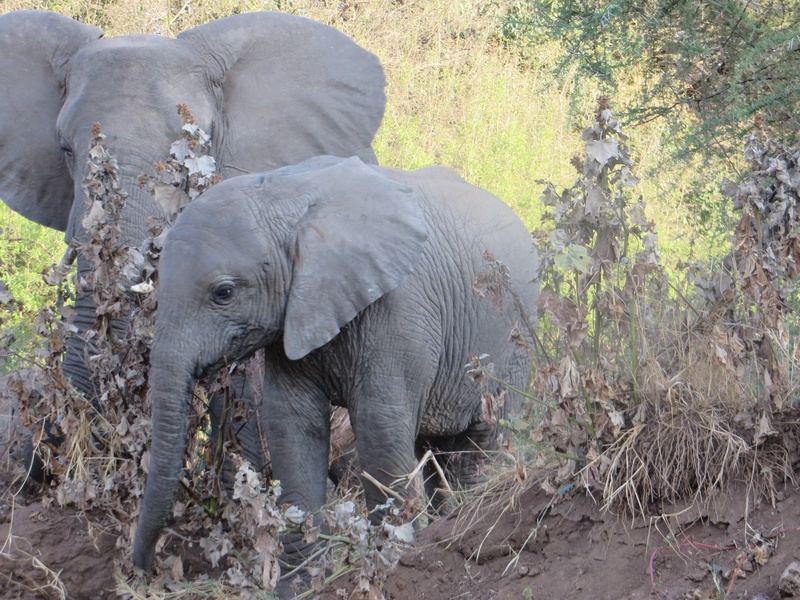 We got to watch them eat, and see the baby elephants. It was very cool. 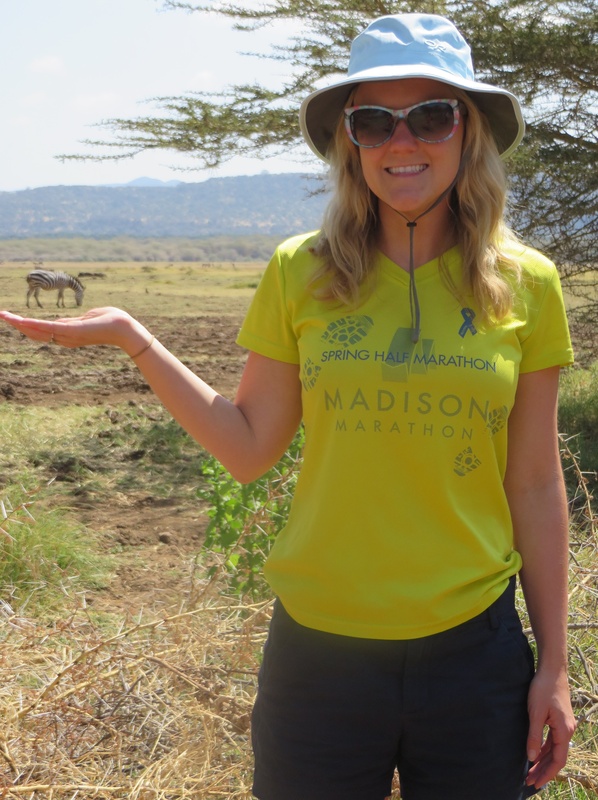 After the elephants, time for zebras, wildebeasts, water buffalo, and some flamingos out in the distance on the lake. The lake was gorgeous – Nick and Brad definitely wanted to water ski on it. The plants and trees are gorgeous too. This place looks just like the Lion King’s Pride Rock. After lots of pictures and videos and just watching the animals, we headed off to our hotel for the evening. This place was absolutely gorgeous. Dinner was delicious, there was an infinity pool, and our rooms were great. Plus, wifi for the first time! Nick and I played cards and enjoyed some Safaris, then time for bed. 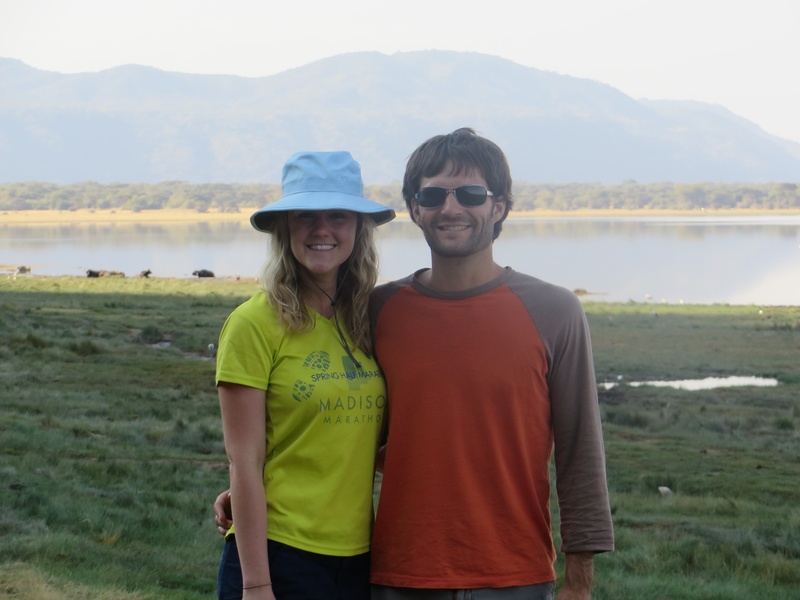 Casey gets here early tomorrow to take us to Ngorongoro Crater, which is supposed to be amazing. 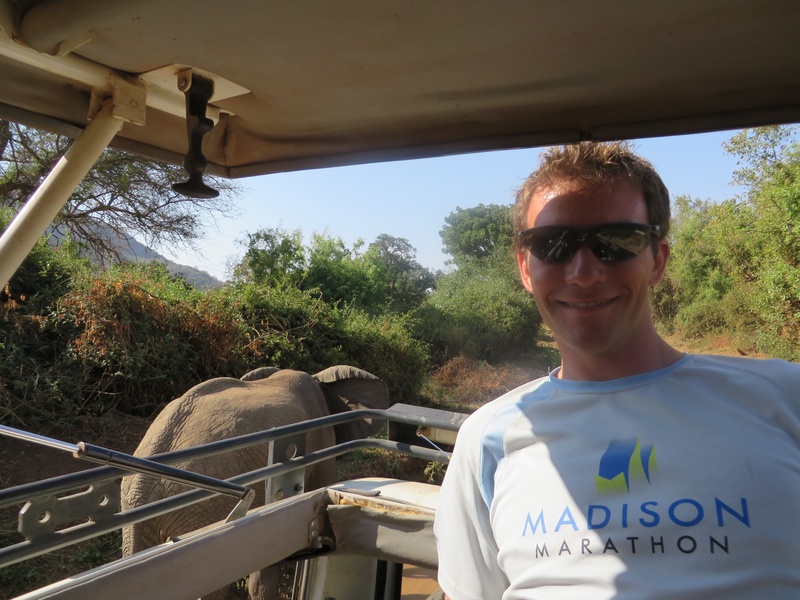 Another quick Casey note – when he first picked us up from the hotel, he looked at me and excitedly said “are you excited to hunt the elephants? !” while acting out something with his hands. Man, did I come to a halt. 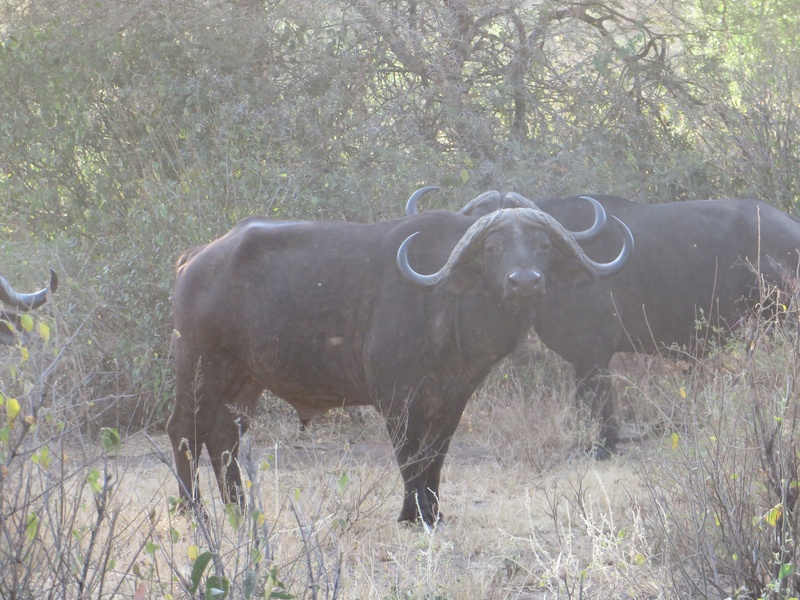 Of course we would be the people that accidently signed up for some kind of black market, illegal hunting/poaching trip. Then we realized he meant “take pictures of the elephants”. Very unfortunate mixup! Nonetheless, Casey was absolutely amazing. We fixed it in bratislava – does it work now? ?